The one-sided and repetitive nature of tennis creates big imbalances in your body. Unless you are already taking care of your fitness training in such manner that you work on re-balancing your musculoskeletal system, you are almost guaranteed that you will get some kind of overuse injury sooner or later. While I don’t like to bring negative news to you, the great news is that it is really easily preventable. 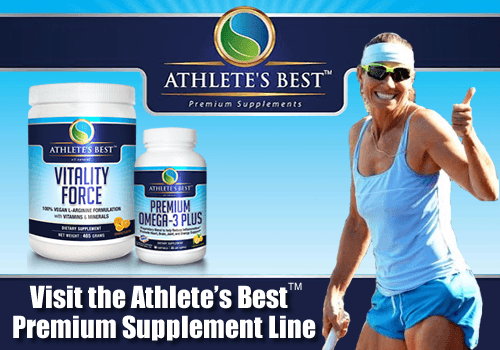 In my previous article about the one secret how to stay injury-free, I got many emails and questions how to figure out that the imbalances are developing and how to know that certain muscles are weak and underactive, and the other overactive and tight. While it seems really easy to see to me, I realize that for an inexperienced eye, it may not be as obvious. With time and experimenting, you will become better on reading and feeling your body and its strengths and weaknesses. One very easy way to see how your left and right side are doing in strength and stability is today’s exercise—the side plank. Just think about how many times you bend and twist during your normal day, and how many times you twist and untwist your upper body on the tennis court. The muscles responsible for the motion are obliques, located on the sides of your core and often forgotten about. We use the obliques much more than we realize. When you have a strong core, your athletic performance will increase dramatically, and simultaneously the risk of low back problems will decrease. However, if you want to remain injury-free, your core needs to be well balanced as well. Which means that if you train your abdominals a lot (because it looks oh-so-good to have a nice six-pack :-) ), you need to train your lower back, obliques and transverse abdominals the same much. If you are new to planks, you may find them very hard at first. You will notice that your body starts shaking after a few seconds of holding the plank position – that’s because of a lack of strength and coordination in the core muscles. The trembling will go away after a few plank practices as you get stronger. You can also control the shaking with deep breathing and trying to relax in all the other muscles that don’t need to work. Get down on the ground on your left side. If you are right handed player, this is definitely your weaker side. Plant your left foot on the edge (not flat on your sole, and not twisted in a weird way… you will see, the foot will want to do it). Now put your right foot nicely on the top of your left foot. Heel on heel, toe on toe. Orderly and even. Put your left hand under your left shoulders and lift your hips up. Support yourself on your left hand with fingers spread out, in neutral position (fingers not pointing to the front nor back of your body). Align your body so that the head, hips and feet are in one nice line. When looking from up, you should look like a nice plank (with a booty). Keep your back straight. When you find your balance, lift your right arm vertically, so both left and right arms are in one line. The goal is to hold the side plank for at least one minute. Switch sides and do another minute on the right side. Pay attention how different it feels. You may notice that you cannot hold the plank half time on your left than on your right. These are serious, yet quite normal, imbalances of a tennis player. Your goal is to work the side plank as often as you can to get both sides almost even. Lift your right leg slowly, leading with the heel. Which means “don’t open your hips so the toes point up so you can lift the leg much higher.” Leading with the heel makes it harder to lift high up, but that’s ok. Just feel the muscles in the hip (gluteus medius, piriformis, TFL, IT band) and try to control the movement in a smooth, slow manner. Hold the top contraction for a half second, and slowly return to the start position. Do not collapse! If you have big imbalances, start on your weaker side first, then do the stronger side, and then do the weaker side one more time, so you can catch up. You notice that if you do the side plank regularly, the strength will increase dramatically rather fast. That is extremely motivating. If you’ve had some aches and injuries, they may even slowly disappear as you get your hips stronger and more balanced. 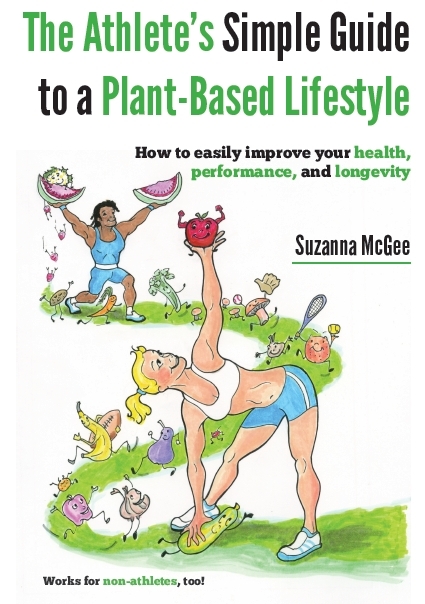 Would you like to carry your own little guide to more great exercises to improve your performance and prevent injuries? 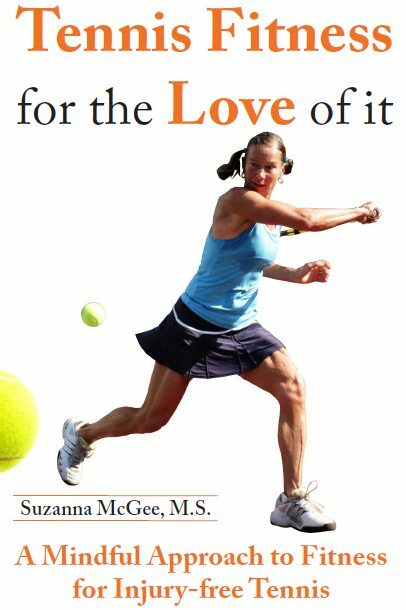 Get yourself “Tennis Fitness for the Love of it” and carry it with you in your bag, always. Getting your hips and core strong will improve your movement on the court during the start-and-stop movements and during the direction changes. Include this side plank to your regular fitness regimen and keep the left-right imbalances in check.